This Atlanta Perimeter Hotel Offers Southern Hospitality Enjoy a memorable stay at our modern hotel near Perimeter mall, part of Atlanta's upscale Corporate Perimeter Ctr. With our courteous staff, reasonable rates and terrific amenities - we're the place to "Stay Smart" in the Perimeter Center area. The Holiday Inn Express Hotel & Suites Atlanta N-Perimeter mall/Dunwoody is directly off Georgia 400 and I-285. This means we're just minutes from several corporate offices and training centers. Additionally: Buckhead, Sandy Springs, Roswell, the Dunwoody Medical Centers, Northside Hospital-Children's Health Care Scottish Rite, St. Joseph's and the Dunwoody MARTA station are nearby. Free high-speed, Wi-Fi Internet access, free local calls, 24hr business center and a versatile 700-sq ft meeting room make conducting business easy when staying at our well-appointed hotel in Dunwoody. Looking for something fun to do? 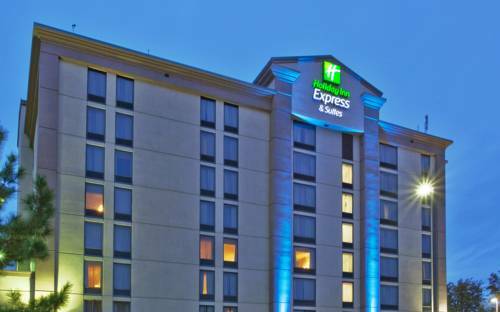 The Holiday Inn Express Atlanta Perimeter hotel is close to many top attractions in the Dunwoody area - including Perimeter Mall, Hammond Park and the awesome Chattahoochee River National Recreation Area. Great on-site amenities include a 24-hour fitness center, free garage parking, an outdoor pool and free shuttle service within a 3-mile radius (Mon-Fri). Best of all, each morning here begins with a free Express Start breakfast featuring hot items like pastries, fruit, Smart Roast coffee and warm cinnamon buns. Our meeting room is made up of just under 1000 square feet of space for all types of meeting functions. We can accomodate 30 people classroom style, 20 people u-shape or conference and 40 people theater style along with 24 people banquet style. Just renovated 18 hole golf course with rich greens and tee times throughout the day. The rates range from $15-$23 per hour. The well lit driving range features state of the art hitting mats. This great course is only a 15 minute drive from the hotel. Hammond Park with tennis, playground, rec facility and walking trails.